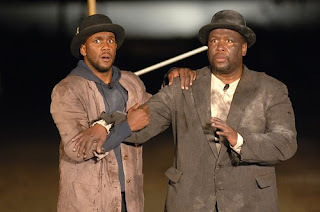 It was a stroke of genius to stage Samuel Beckett's seminal play about waiting in a devastated city that had been waiting ever since 2005, when Hurricane Katrina struck, the levees failed, and the city was flooded. In 2007, when the play was staged, many people were still waiting to get out of FEMA trailer parks, waiting for the levees to be brought up to snuff, or waiting for insurance money to come through. Not to say that New Orleanians hadn't been active in their own affairs: on the contrary, citizens were doing more than any government for the resurrection of their homes and lives and their city. But no matter how much they could do on their own, larger forces were at work that compelled them to wait. The basic infrastructure of schools, flood protection, health services and so on had to be rebuilt, for this one-of-a-kind city to be inhabitable again. As much as "Godot" is about waiting, it is also about action, as Holland Cotter pointed out in an excellent article in the New York Times. He writes that while the artist is part of an art industry "driven by a thumbs-up, thumbs-down imperative," still "Mr. Chan wants to try out -- everything is a tryout -- a new story, as have other artists, Beckett among them, who feel they are living in a time of moral emergency. The soul of 'Godot' isn't in Vladimir's despairing cry of at being marooned in nothingness, but in something he says later in the play: 'Let us not waste our time in idle discourse! Let's do something, while we have the chance! It's not every day that we are needed. Let us make the most of it before it is too late.' When these words rang out in the night in the Lower Ninth Ward and in Gentilly last month [the neighborhoods where the play was staged], every person present knew exactly what they meant, in that place, at this time. And Mr. Chan knew, which is why we were there in the first place, participants in an art project that had everything, or at least a lot: objects, words, images, ideas, emotions, discourse, actions, lessons, beauty, politics, criticality and generosity. At the same time, it wasn't all that big a deal. An artist -- an unusual one, to be sure, and rarely idle -- saw a chance and made the most of it." I imagine that it was the convergence of factors -- the condition of the city, the vision and hard work of the people involved, the quality of the night air during the shows, the gumbo meal that was served beforehand, the neighbors gathering for a performance that might speak to them, the chit-chat and conversation you might share with the people around you -- that resulted in what, for my friend anyway, was a rare and special experience. For me, the story of "Godot" in New Orleans is the story of a missed opportunity. Maybe I'm inclined to romanticize the production precisely because I didn't see it -- after all, it's the one that got away. Perhaps I wouldn't have liked it, or might not have been ready for it, might not have come with open ears, or might have eaten too much gumbo and gotten a stomach ache, might have been unable to hear very well, or might have had an obstructed view or something else on my mind. Who knows. But in the event, the feeling of missed opportunity makes me more inclined to take a chance -- just as Paul Chan took a chance -- in creating or taking part in such stories. Documentation of the project (photos, a short video, Paul Chan's artistic statement, including discussion of his work in New Orleans) is on the website of Creative Time, here. I understand that a film and exhibit about the project is scheduled to take place starting this June at the Museum of Modern Art in New York City. Now that I will not miss! I am not sure if you are the same writer who wrote "A Lineman in My Bed: Notes on Teeth Grinding". I have been plagued with Chronic headaches and I know its from Clenching my teeth. The reason I tried to find you is it is the first article that I have read that hit home. I have done everything you have done that you metioned in the article. I know it was in 2007 but I was wondering if you have found a cure that may help me. I think you left off with trying acupuncture. SECOND PERSON STORIES -- THAT'S YOU!